One does not simply recap MarsCon in a podcast that lasts less than 4 hours long… Well, maybe they do on other podcasts, but not us. 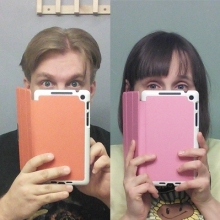 I simply don’t have the time to edit things down, because I’m far too busy secretly writing song parodies and coordinating the creation of elaborate costumes, wigs, and props, so as to surprise said MarsCon audiences with such things, as Carrie and I are so pictured here. 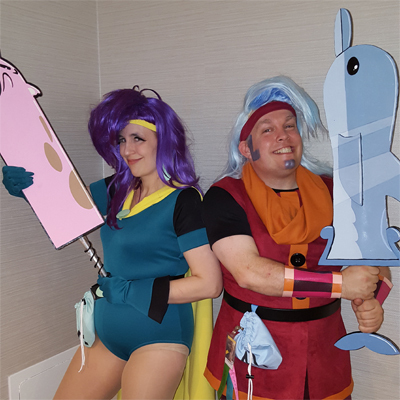 The primary target of this “Mighty Magiswords” related surprise of course was show-creator and Prohyas-voicer “TV’s Kyle” Carrozza and his epic wife Lindsay Smith, who join us on this podcast to talk all about the big she-bang that went down. The rest of the episode is mostly just Carrie and I recapping MarsCon 2016, inexplicably recorded on holidays again, including Easter, April Fool’s Day, and we’re posting it today which is Dr. Demento’s birthday, which isn’t a national holiday, but should be. The comedy & music tracks in this episode are by the great Luke Ski featuring Carrie Dahlby, TV’s Kyle, Power Salad, The Frantics, The Gothsicles, Jamie Kennedy & Stu Stone featuring Bob Saget, Tenacious D, Dave Cox, The Consortium Of Genius, Tom Smith, MC Lars, Da Yoopers, Katie Goodman & Soren Kisiel, Melissa Rauch, The Arrogant Worms, and Cobra Starship. Oh, and one more thing, PLEASE LEAVE US COMMENTS!!! Our past 2 episodes had zero comments, so please leave us some kind of comment so we know that anybody out there is actually listening to this, which I realize in and of itself is a long shot. In any case, hope you enjoy listening to the show as you simply walk into Mordor. Fulfilling the request for comments. In hindsight perhaps I should’ve listened to the episode first. I’d have something to say then. I formally request Drunk Luke for Central City Comic Con 2017! Anyway! You guys are awesome and somehow manage to keep me completely entertained while I work on silly costumes. Cannot wait for the next one! Okay, first hour or so done. Great job on the Warrior parody. Glad to hear MarsCon went over well. That one’s on the short list of cons I hope I get to go to someday. Regarding one of the songs played so far… a rap song about Bob Saget? Okay, pretty sure I can safely say I’ve heard everything now. No comment on if that statement is a positive or a negative. Congratulations, I suppose, on getting drunk for the first time. I notice that how I act is not too different from how you act, though I tend to talk faster when it happens. And I don’t laugh as much. Not that I do it often. In fact last time it happened was in 2007. Did someone ask for … feedback? I can do that! Because I am, indeed, listening. So, Luke, as a 40-something-more-than-you who also doesn’t like the taste of alcohol, has never been drunk, and doesn’t aspire to get drunk, I’m curious. I don’t know that you really described the experience of being drunk. Or do you really remember it? I take it from what you did say it wasn’t really anything special or particularly desirable to repeat. 3:00:07 And now I’m in this too! Well, my name, anyway. I honestly expected Luke to be more giggly after some assertive drinking. Did you experience any flashes of creativity on the way up or back down? The couple times I’ve coded after a beer or two produced interesting results, and not necessarily bad ones. Gimme a number or yer fired. Thanks for the very thorough review of MarsCon. I always buy the fundraiser CDs and enjoy listening to the post-con reviews. Maybe I’ll actually make it out there one day. I’m glad Alex’ pre-school situation is working out so much better than the Waldorf School experience. Best wishes for awesome experiences to all involved! I was happy to hear about Luke’s first legally drunk experience, and particularly appreciated the audio recorded that night. I agree with his sister that the “hi” section at the beginning was amazing. Working on the song spreadsheet for this podcast always gives me an interesting perspective on the song choices in each episode. This time, I was interested to see that Luke was obviously still working his way through his old song collection year by year. I was particularly fascinated by the synchronicity of the fact that The Gothsicles & MC Lars released their respective Hot Topic songs the same year. Also, while discussing songs, I know you generally keep the song choices around a PG rating, but I just wanted to say that I loved the “more adult” songs, and found them really funny. So we’re numbering our friends now, eh? You silly peoples. Just for the record, on my list, Luke is #17. Carrie is #5. Yep – still listening. Holy crap though, 4 hours? I almost gave it a skip based on the length, but didn’t want to break my 123 episode streak. For what it’s worth, I’m 44 and still have never been drunk. I do like a good beer now and then, but have this phobia of not being in control of myself. I’m afraid I’d be a mean drunk. And with my Native American genes, I’m already predisposed to alcoholism, so I’ll just continue to give that a miss. I do listen, but sometimes it isn’t right away. I’m listening! I’m not done yet, but the part of the episode I’ve heard so far is rad. I think my favorite moment of the show so far was during the crossover with Talk About Tunes when Ian screamed. That’s right, I enjoy Ian’s screaming. Don’t judge. I am actually behind again, I need to listen to both this episode and the previous one. But I will listen once I have time at work, or over the weekend. Wait… what’s this about numbers… I am not a number! I am a free man! I will not be pushed, filed, stamped, indexed, briefed, debriefed, or numbered! My life is my own! Wait, what? Maybe this is a good thing. Do we get to pick? I’m sure 27, 42, 69, 666, and 1 are all highly sought after numbers and may be reserved. The transcendental numbers (like pi & e) may be too predicatble – what about the square root of negative 1? A number like the square root of negative 1 is approptiate for a “listener” of someone else’s show or podcast. I thought I left a comment a couple weeks ago but after looking closer at the form on my tablet, it looks like I did not fill the required info to get it to post. Very happy that I made it to Marscon for the GOH concert as well as the rest of the weekend as my work situation was pushed back two months. Had the Meep Morp people not been pointing a camera in my direction before the concert as Kyle was behind me, I might have figured out the beginning having seen Carrie followed by Holly go backstage as well as Luke blocking off more of that area. Hearing the podcast reminded me of the past and not just early March. There were years I saw Luke perform over 10 shows. Though I still need to update the map, Marscon marked the 50th time I saw Grease Wars performed live. Though I miss wondering what con is next, I am glad thousands will be experiencing Luke’s talent as opposed to a partially interested dozen or so people at a con. I have listened. I am listening. I will listen. Because the thing about listening is, you hear things. Wow, those are some great costumes! I wish I could have made it to MarsCon this year. See you at FumpFest! Speaking of numbers, my favorite number this week is the Euler-Mascheroni constant, which is about 0.58, or 11/19. Interestingly enough, nobody has managed to prove it’s irrational yet, but if it’s rational, it has at least two hundred and forty thousand digits in the denominator. BTW, Euler is pronounced “oiler,” not “yooler.” Also, “rational number” is a fancy term for “fraction,” and the denominator is the bottom part of the fraction. If you already knew that, great. If not, you can commence forgetting it again… now. This comment brought to you by Irritating Math Geek Productions. I just called the thing! 916 LUKE SKI. IT EXISTS!! !